He pulled me into his arms, smoothly, coolly, as if he had done it a hundred times before. He was somebody’s cousin from South Carolina, visiting for the holidays. We weren’t a dancing crowd, this group of friends from high school, now far flung to college, and first he had us pushing back the furniture and playing records, and then we were in cars driving to the Hilton near Busch Gardens, the only place we could think of with a dance floor. I had a feeling the music would be all wrong. I could hear it when I went with my William and Mary friends to play Donkey Kong in the hallway outside the bar. Somebody’s cousin loved to dance, and he was good, and he shared his goodness with all the young women, one after the other. I did not expect to be favored. It was the Christmas vacation after a break-up, and I expected nothing. But he stepped toward me, and he smiled, and I went with him to the little dance floor with the godawful disco ball hanging up above and tried to get my breath, because I wasn’t sure if I could do what he did. It was my dream, you see, to dance with some preppy boy who actually knew how to dance. 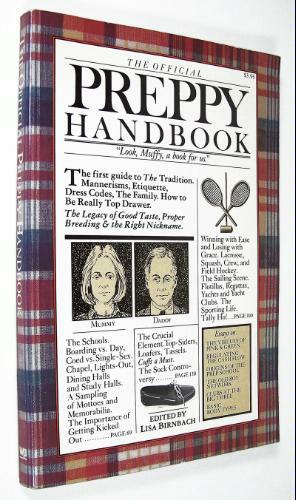 I was drunk on the fumes of The Preppy Handbook, which pictured a world of categories (where all the boys taped their Topsiders and the girls wore pearls and knew the rule, “get completely dressed for a party, then take off one piece of jewelry) that felt safe and explicable. He pulled me into his arms, and there I stayed because the song started slow, and I really didn’t want to be that close in his arms for the length of a song, I realized that quickly. My breath was short. Before I could grown too uncomfortable, you’ll know this because you’re hearing the song in your head, before I could wish it was really over, the beat increased and I was flown out and pulled back, shagging to disco. I liked the attention, but when it was over, I didn’t want more.